ON TOUR 2014: Any more shows to come…? So it’s the end of March… Is there more news to come about the 2014 summer tour? 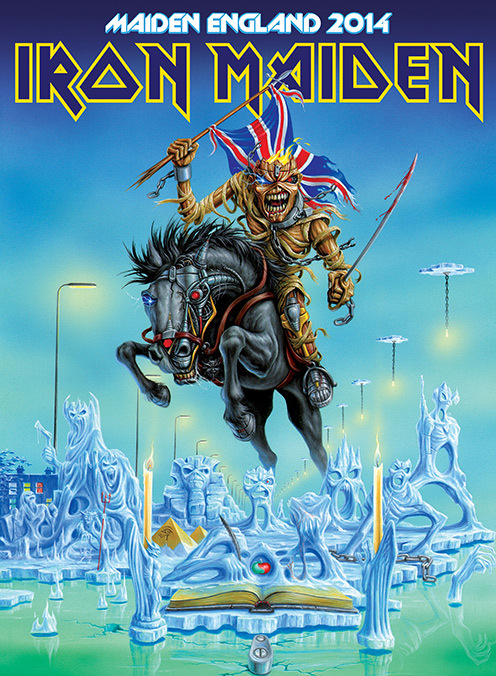 It’s March 26th, and just over 8 weeks until Iron Maiden’s final ever History tour gets its last leg going. It’s been quiet for a few weeks now, and the tour dates currently stand at a number of 20. Are there any more to come? You’ll notice that the precise dates for Maiden’s performances at Rock Am Ring and Rock Im Park have now been set. So, does any window for gigs seem likely between Barcelona and Knebworth? Or could there be an opening gig somewhere around May 25th? Check out the official tour dates right here! Not long until Maiden England 2014 kicks off!!! Still hoping for more UK dates!! Curious to know what makes you think this is the “final ever” history tour? Did I miss an announcement? Was looking forward to a NPFTD/FOTD tour! Bruce specifically called it the last of Maiden’s History tours in the Sonisphere UK announcement. It’s at the Sonisphere website, Dec 2nd. And Rod adds it’s likely to be the last set based on the 80s (at the tour date link above). Btw, where in the schedule do you think they would be able to fit in more UK dates? Any specific cities you’d hope for? Ahhh I see. I didn’t know they’d semi-officially announced it. Fair enough! I think what would be nice would be to see some more tracks from NPFTD & FOTD included in future setlists. Aside from FOTD title track, those 2 albums get overlooked in the live cannon since Bruce’s return. There are some great tunes on those records! As for fitting in more UK dates, I’d simply tack them onto the end of the run. They finish at Knebworth so the whole shebang is in the UK anyway. They could do stadiums in areas that will allow people less hassle travelling (Murrayfield for Scotland, Newcastle/Sunderland for the North East, Cardiff for Wales etc) or they could go to the arenas. I’ve said it before here, but I do think it’s a shame that there is no arena tour for this. I think it’s a shame that all the other ‘History’ tours didn’t hit the arenas in the UK. But what can you do! I agree about the 90’s revisit. That would be known as the “Maiden Awkward” Tour. I’m tempted to go to Sonisphere, I’m even booking time off work, but it’s so expensive & will probably hardly see a thing from miles away. I hate festivals generally for this reason, I’m still hoping for another 02 arena gig but Maiden are so far from treating their English fans right these days it’s a joke. This should be called the ‘Maiden everywhere but England tour’. Like I’ve said before, Ziggy, at least England got 4 gigs on this tour. Plenty of countries and even continents got none. But it would certainly have been the obvious tour for a UK arena tour, concept-wise. I’m hoping they announce a Chicago, IL date on May 25th. And hey, at least the rest of us non-Europeans will likely have some sweet proshot gigs to watch (most likely Rock am Ring, maybe a couple others). I think they’ve covered the US and Europe (including England) well on this tour. Not too bad for South America, either. The biggest surprise for me is that they didn’t take this show around the globe like they did Somewhere Back In Time. Not in any of the three years. I’d guess it’s because the cost of operating Ed Force 1 was too much? Not sure if the cost was a problem. After all, they make stupendous amounts of money on these tours. But it’s certainly not a simple thing to pull off, logistically. Then again, they could easily tour Japan and Australia without it. True, who knows. I’d imagine maybe it’s just not worth the trouble in their minds? I would say it’s because Japan and Oz already got SBIT with basically the same setlist… but that hasn’t stopped them from touring anywhere else in the world where that is also true. The way they’ve been behaving about a lot of aspects of the Maiden England tour has left me baffled. You’re definitely not alone in feeling like that. – Only 3 songs not performed on the previous couple of tours. And that would have been the case also if Infinite Dreams had stayed in the set, because then Afraid To Shoot Strangers would not have been there. – Sold as Maiden England and a focus on the late 80s, but nearly identical to SBIT. – Not one single change in the setlist from 2012 to 2013, during a 9 month gap. – A tour being stretched over three years, from 2012 to 2014. But, on the other hand, it’s been so long since they’ve played Japan and Oz you can be SURE shows there would be immensely successful, despite the repetitive nature of the actual show itself! SO MUCH BAFFLING. My guess, now that the summer schedule seems just about full, is that the UK will get an arena tour in 2015 for the new album. We can only wait I suppose christer – I’d travel for another O2 show or any other arena show – failing that it’s a year long wait !! Looking forward for this tour to (finally come to an end) and I can’t wait to hear the new (and last most likely) maiden album.. In other cases I’d be looking forward to see what kind of setlist they’d come up with, but maiden never surprises me (at least me) anymore.. So I can’t wait for this tour to come to an end and wait for the REALLY big “news” afterwards…. Well, it’s just 4 weeks until the tour kicks off, so it’s probably safe to assume there won’t be any more gigs than already announced.